Spring has finally arrived, and with it comes one major necessity: al fresco dining. 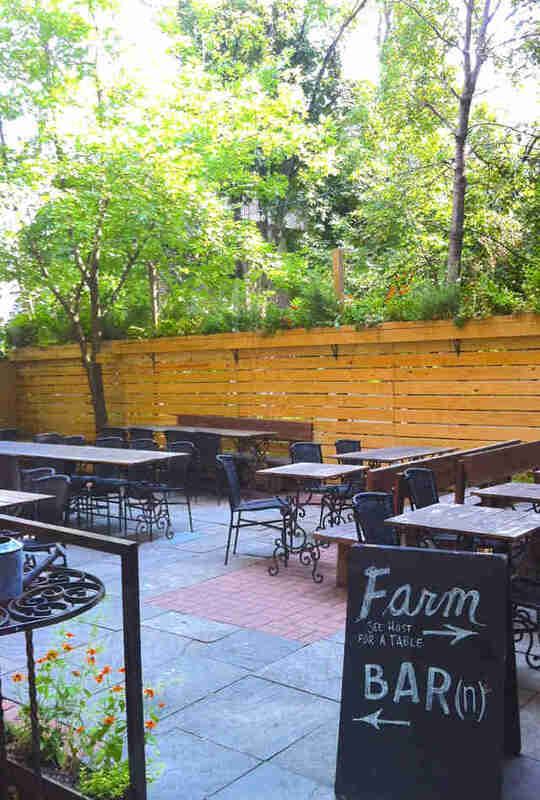 Street-side dining and rooftop boozing are great outdoor options, but absolutely nothing beats the cozy charm of an obscure urban garden. 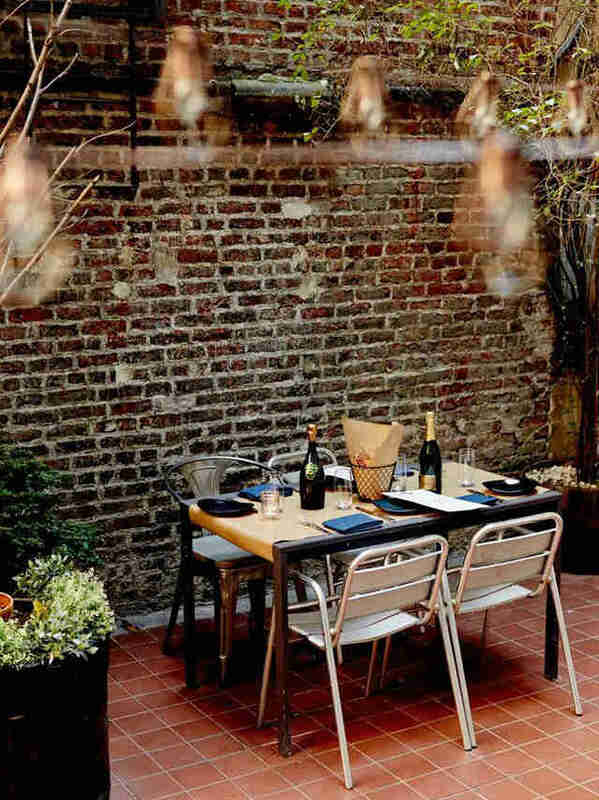 So we scoured the city for the best hidden gardens at the tastiest restaurants -- some are surprising, some are old-school favorites, and all of them will make you want rosé ASAP, even if you adamantly hate it. Tucked inside a corner townhouse along West 10th, Bobo exudes charm in everything from its whimsical atmosphere to the carefully curated menu of classic French dishes like foie gras with brioche, duck l’orange, and prime rib for two. A year-round, parlor-floor terrace only adds to its appeal, so be sure to request special seating when making a reservation -- its Saint-Tropez vibe is not to be missed. This snug, counter-service spot serves up hearty Caribbean fare like pom pom shrimp with garlic fries, jerk ribs, and a great selection of seafood boils paired with signature sauces like coco curry and ginger butter scallion. 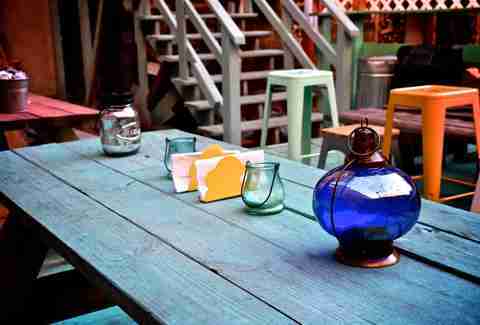 And to enjoy all this fresh, flavorful food, there’s a low-key patio out back filled with caribbean-colored picnic benches and metal stools. 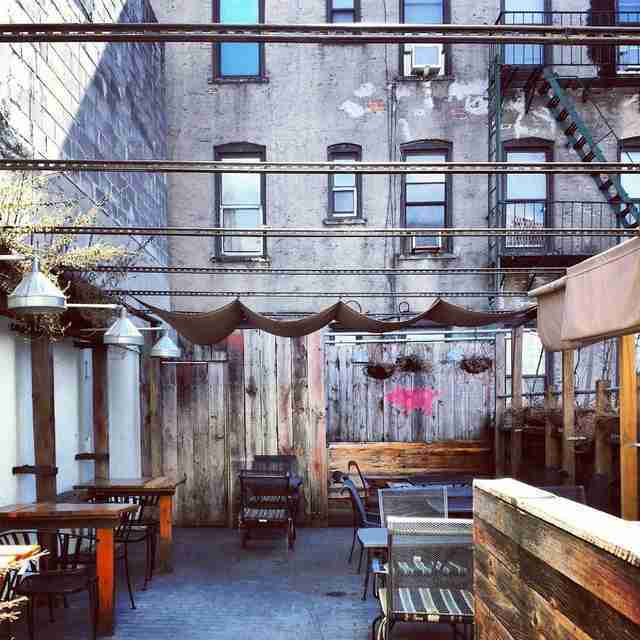 The gold-standard of hidden gardens, there’s nowhere in the city quite like The Waverly Inn. A dramatic space with soaring ceilings built around full-grown trees, dining in the garden is akin to dining in an enchanted forest, and the food is just as good, too. Tuck into chicken pot pie, steak tartare, and the splurge-worthy truffle mac and cheese, a special that changes daily. But as grandiose as a meal here may be, don’t expect to snap any pics -- the no photography rule is strictly enforced. This panini restaurant delivers absolutely insane pressed sandwiches like Italian meatloaf with onion jam and provolone, porchetta with spicy pickle slaw, and chorizo with truffle aioli. But sandwiches aside, the best part of this neighborhood spot is the surprisingly spacious hidden garden with wood paneling, hanging plants, and retractable canopies for when you need some shade. Unlike most coffee shops, the major draw of this joint isn’t just the strong brews, but insanely tasty specialty sandwiches like smoked salmon with lemon dill mayo, chipotle chicken with fontina and arugula, and pulled pork on a brioche bun. Most importantly, you can enjoy all this laid-back fare in the cozy rear garden accented by poppy-red chairs and lattice wood fencing. 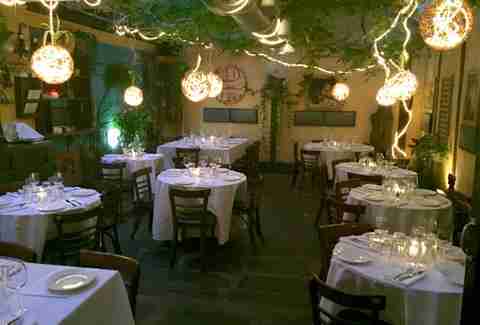 This charming trattoria delivers substantial Italian tapas in a Tuscan-inspired setting complete with a romantic hidden garden. The menu is an appealing mix of large and small plates -- think fig and ricotta crostini, shaved brussels sprouts with pecorino, and rabbit pot pie -- so it’s always an enjoyable pitstop. 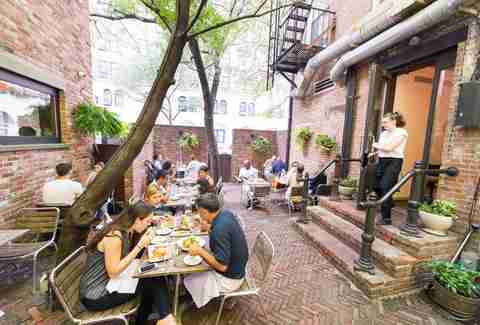 And when dining al fresco, be sure to look up; the garden is surrounded by soaring townhouses. A self-proclaimed “butcher's restaurant,” this meat mecca is also home to a surprisingly dainty patio that’s appointed with bench seating, strung lights, lots of greenery, and an awning that makes it a year-round option. Enjoy adventurous entrees like General Tso’s pig’s head, bone marrow brulee, and lamb & Gruyère sausage all in the great, urban outdoors. A surprisingly large rear garden emerges from the narrow interior of this farm-to-table Prospect Heights spot, but the airy space cloaked in ivy & brick is just the beginning of the charming experience -- friendly service, local clientele, and a menu boasting rustic eats like seared duck breast and lamb chops with mint complete it. A canopy of trees dramatically serve as a garden “ceiling” at this endearing Italian restaurant that’s reliable and low-key. But while dining here is always a good option, we’re partial to eating during the early-bird special -- served daily from 4-6:30pm, when diners can enjoy a salad, soup of the day, choice of seven classic entrees (chicken Parm is on the list), plus coffee and tea for just $13.95 per person. Classy comfort food is the name of the game at this LES hotspot known for it’s extra-crispy buttermilk fried chicken and sizable selection of Champagnes. And with a giant courtyard punctuated by tiled floors and draped industrial lighting to enjoy your food in, there’s no better place to splurge on tomato pies, heirloom grits, and jalapeño cornbread in style. This beloved neighborhood joint delivers classic bistro fare like braised pork belly, cornish hen coq au vin, and Provencale mussels at surprisingly reasonable prices (most entrees are $25 or less). But best of all, the back garden brims with Parisian appeal -- mosaic-tiled tables, leafy tree cover, and delicately strung lighting help set the mood. 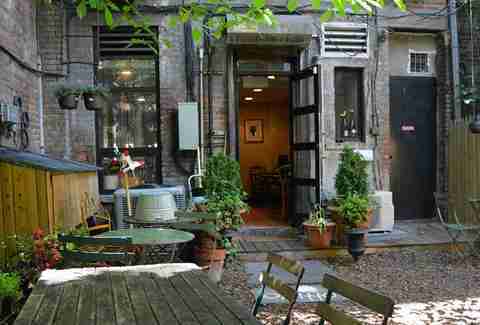 Gnocco’s courtyard isn’t just massive, it’s gorgeous too. Old-world art, mural-splattered walls, and weaves of tree branches are all part of the allure, not to mention a menu loaded with northern Italian specialties like tagliatelle with beef ragu, burrata with bruschetta, and traditional arancini. A brick-tiled garden complete with weeping willows, potted florals, and dangling windchimes is one major draw of this City Island spot. The other is the reliably tasty American seafood menu featuring everything from steamed New Zealand mussels to crab cake sandwiches with chipotle mayo and tequila lime shrimp. 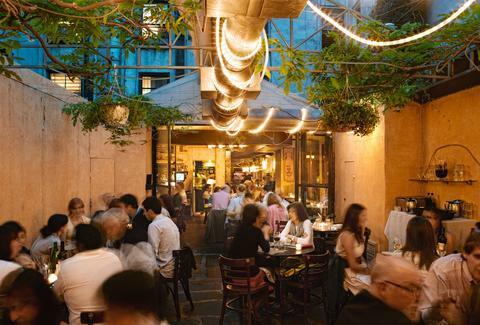 Trestle has been a Chelsea mainstay for years, but it’s seen a surge in relevancy thanks to its close proximity to the High Line and the impeccable maintenance of its mammoth garden. Nestled underneath a sprawling cherry tree, it’s the perfect backdrop for dining on American eats like steak tartar with quail egg, crab cakes on toasted brioche, and goat cheese gnocchi with swiss chard. 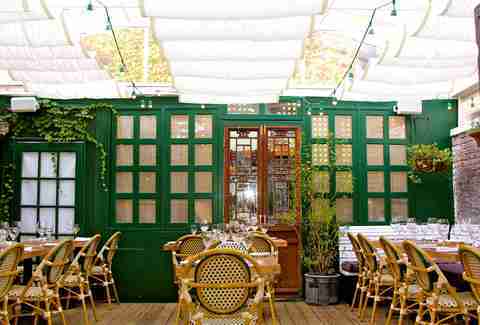 This Cape Cod-inspired upscale seafood spot has the ability to transport you from the East Village to the beach, both with its menu of blue point oysters, charred octopus, and lobster Gruyère gratin, and with its beachy and serene hidden garden out back. Christine Fischer is a freelance writer for Thrillist who is desperate for a picture inside The Waverly Inn. Follow her on her website, Facebook, or Instagram.